Buchanan, and what some call his Virginia school of political economy, was defined by his uncompromising vision of government as essentially the facilitator of theft – from ‘makers’ who earn their money through hard work and entrepreneurialism, to ‘takers’ who make use of social programs funded by public money. The broad contours of this philosophy, though complex and at times contradictory, are familiar to most observers of American politics. What is perhaps more deeply troubling is MacLean’s history of how these ideas have been imposed, and campaigned for, through the organised politics of the right. This movement is eye-wateringly strategic, and is backed by enormous amounts of money. This is a critically important history because too often, the public (or the demos of democracy) is blamed for the dominance of right-wing ideas. Mitt Romney famously stated that forty-seven per cent of voters were effectively leeches on the productive members of the economy. Hillary Clinton labelled this same class of people ‘deplorables’. These offhand comments belie a common cause of disgust with working people and users of public services, otherwise known as the American public. This has broader implications: it supports a presumption that the poor state of political affairs and public debate, from underfunded schools and health systems, to climate change denial, is the fault of poor people too stupid or bigoted to know better. MacLean shows that the reality is far more complex. Buchanan was the brains behind the operation, but it was Charles Koch’s money that turned this into a sophisticated movement. It is made up of a dizzying array of well-funded organisations, working in academia, lobbying and public policy. They help draft local legislation, push for reforms that result in voter disenfranchisement, run well-funded primary challenges to discipline elected officials, and use summer programs to train judges on applying free market economics (in 1990, it was estimated that they reached an estimated forty per cent of federal judges via this method). They also operate in stealth. 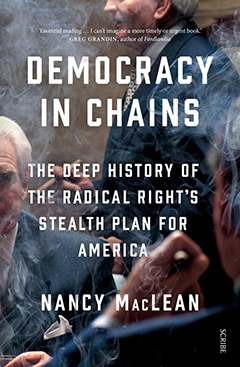 As MacLean puts it, Buchanan in particular came to the realisation early on that, as she puts it, ‘the American people would not support their plans, so to win they had to work behind the scenes, using a covert strategy instead of open declaration of what they really wanted.’ Koch agreed, and funded an institutionalised version of this strategy. MacLean documents this meticulously. From the campaign to resist desegregation of schools in the South, to defunding of social welfare programs, this movement pushes for policies that are not the will of the people. The right finds ways to introduce these political objectives, then aims to legislatively lock them in, trying to insulate their movement’s gains from processes of democratic accountability. They see themselves as saving capitalism from democracy. It is curious to read MacLean’s account of how right-wing theorists and activists draw on left-wing thought, particularly Lenin, to prosecute their cause. The centrality of class is the moral claim that drives the right, and this is a familiar theme (if in reverse) in the work of Marx. As for Lenin, the right clearly appreciate his strategic contribution to making social change through the use of an organised cadre, even if they rejected his politics. To be clear, this is not some appeal to horse-shoe theory – if anything, it is a confirmation of left-wing thought and strategy (even if it comes from an unexpected place). Organising and strategic legal advocacy has long been a staple strategy of the left; it should therefore be no surprise that the right has begun to use the same tactics. Something of a companion to Democracy in Chains might be Martha Davis’ Brutal Need (1995). That book tracks the movement for court recognition of welfare rights by left-wing activist lawyers beginning in the 1960s, and the tactical perils associated with that strategy. But MacLean draws an ethical difference between the left and right; the left is open about its aims, the anti-democratic right is covert and therefore loses any moral claim to politics. Her history is designed to give readers a grasp of how the right uses this strategy, but it also offers some fascinating glimpses into how the right understands the left. MacLean paints a dark picture of a fettered democracy. She points out how scandals like that which happened in Flint, with the poisoning of the water supply, are ‘directly attributable’ to the growth of this movement and their organisations funded by Koch. The right is also the obvious beneficiaries of viciously anti-union legislation like that introduced by Wisconsin Governor Scott Walker in 2011, and this being used as a model for other states. But the question remains: how do we rise like lions and lose these chains? If the left aims to retake power over these institutions and processes, it is clear that they are facing a formidable opponent: well-funded, well-planned, and with a pipeline of supporters, from college campuses to representative bodies. To what extent is it possible for the left to effectively intervene into institutional environments of the state, if they are always to some degree working to mediate democracy, rather than embrace it? Equally, in organising elsewhere, to what extent has the left also let these bodies been commandeered by the right? These are old and difficult questions for the left, and the answers are much larger than this book. One of the first steps towards turning this around is developing a coherent history of right-wing ideas and activism, which is MacLean’s contribution. It is telling that MacLean has discussed the criticism of her book by a slew of right-wing academics (many others have praised it), many of whom also happen to be recipients of Koch funding in one way or another. It is a brave person who weathers these storms, and this particular response demonstrates the importance of this work. Building up a history and tradition of understanding the right, and resisting all the anti-democratic effects of their organised form of politics, is deeply important work at this moment. Nancy MacLean will be speaking at the Melbourne Writers Festival on 1 September and at the Brisbane Writers Festival on 8 September. I do like Prof MacLean’s book very much! For me personally, it’s just kind of a beginning. port of the Thomas Jefferson Center for Studies in Political Economy, February 10, 1959, C. Harrison Mann Papers, Special Collections and Archives, George Mason University (also in BHA); James M. Buchanan and G. Warren Nutter to Leon Dure, Aprill, 1959, box 1, Leon Dure Papers, Manuscripts Division, Alderman Library, University of Virginia. Without having reader’s capability to quote from such sources, we can hardly make use of the book when our societal lives abroad are at risk. So I call on you the article writer, Lizzie O’Shea, and on author Nancy Maclean, to make bulk copies of the original straight talking/plain-language of Buchanan & Nutter available for us all! Ps: please send some kind of recognition-confirmation to my email-account!